All-Purpose The North Sails VSM-1 Vaurien main sail is designed with bi-radial panel layout which allows better orientation of the fabric and offers maximum shape retention in high load areas of the sail. With more radial panels than a conventional cross cut sail we can apply shaping exactly where it is needed to make an extremely smooth and accurate sail shape. 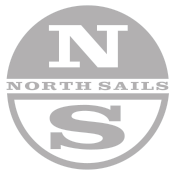 All-purpose The North Sails VJ2 jib jib offers maximum shape retention in high load areas of the sail by using optimized cloth orientation. Careful positioning of shape ensures that this sail will perform very well across the wind range. All-purpose The North Sails VSR-3 Vaurien spinnaker features a cross cut design.